The world's most fragile marine ecosystems are in decline. 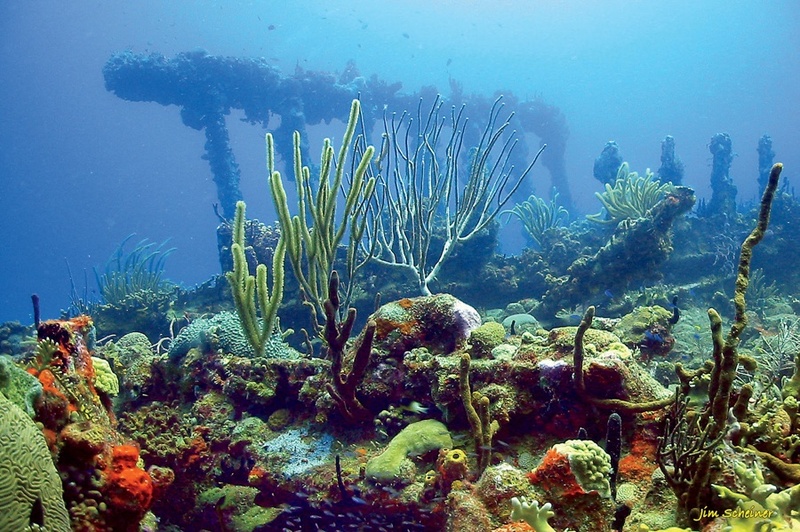 Shallow-water coral reefs are best known for their beauty, and as home to rafts of colorful fish. That these complex ecosystems support a quarter of all marine species is less commonly appreciated. If the nutrient-poor open oceans of the world have been compared to lifeless deserts, reefs—which grow beneath just one-tenth of 1 percent of the ocean’s surface—are more often compared to rainforests. That’s not only because of the biodiversity they host, but because of their important role in “primary production”: the utilization of chemical or light energy in the conversion of inorganic into organic matter that forms the base of the food chain. “Primary productivity in an acre of coral reef is actually greater than in an acre of tropical rainforest,” says professor of biology Robert Woollacott, curator of marine invertebrates in the Museum of Comparative Zoology. The nutrient-rich waters surrounding coral reefs support a large population of fish that are captured for the global trade that stocks both restaurants and aquaria worldwide, and also represents an important food source for marine predators and birds. The fact that reefs every-where are threatened, therefore, is more than just a sad footnote to the ecological changes that are taking place on land. When a reef goes, it takes a key part of the global marine ecosystem with it. 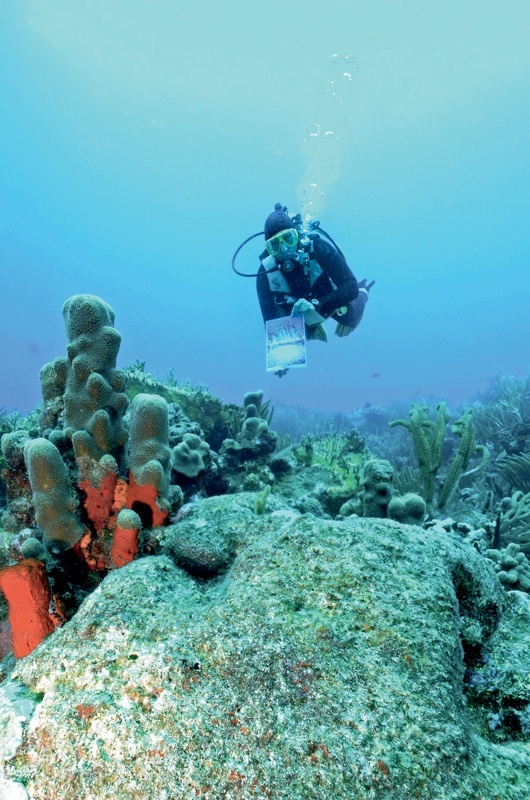 Photographer David Arnold ’71, who in 2005 documented melting glaciers (see “A Melting World,” May-June 2006, page 36), has now embarked on a project to document the decline of shallow-water coral reefs. Working with some of the pioneers of underwater landscape photography, Arnold this year visited the same places they had photographed years before. 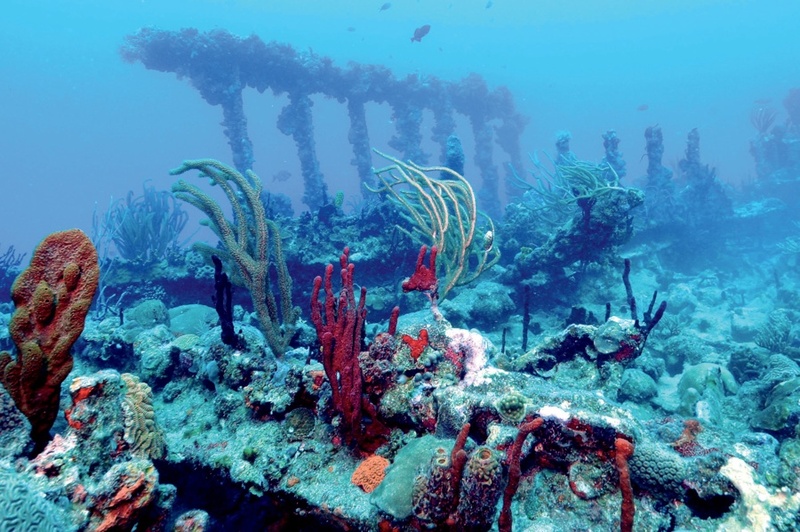 The earliest images reproduced here were made in 1970 by freelance photographer Jerry Greenberg (who appears in the Carysfort Reef photograph taken in 2010 [see second photo in the image gallery]); the most recent of the “before” photographs in this series from Key Largo and the Caribbean were made in 2004, just seven years ago. 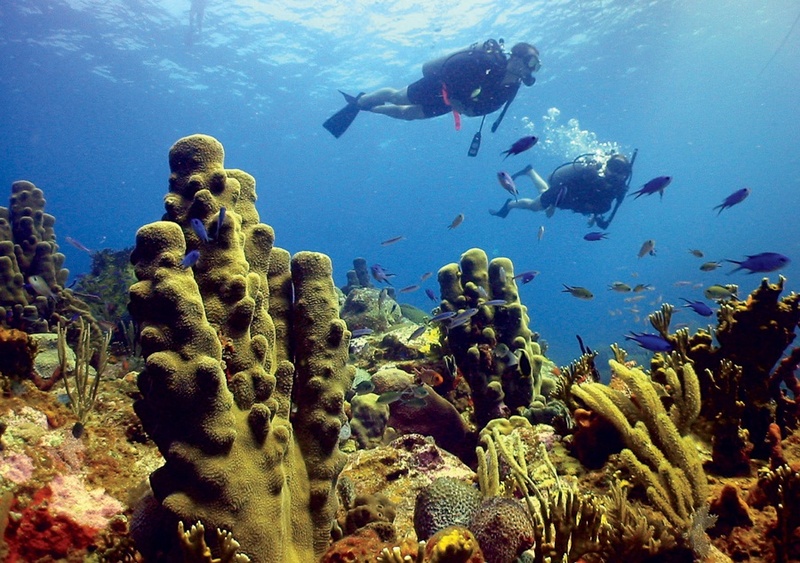 Unlike glaciers, which melt or freeze according to the temperature, coral reefs are not simple. “It’s death by a thousand cuts,” says Arnold. Threats can be local or global, and are at least in part the direct or indirect result of human activity. Ocean warming, high-intensity storms, sedimentation, nutrient runoff, and overfishing can all destroy a reef. Coral grows in the presence of a captive photosynthetic organism called a dinoflagellate; its pigments give the coral some of its color, and it provides the coral with sugars that enable it to grow. If that relationship breaks apart—in response to heat stress induced by a change in sea-surface temperature, for example—the coral is said to bleach; it will die and break apart if not repopulated by another dinoflagellate. Global warming is thus a notable threat to coral reefs right now. 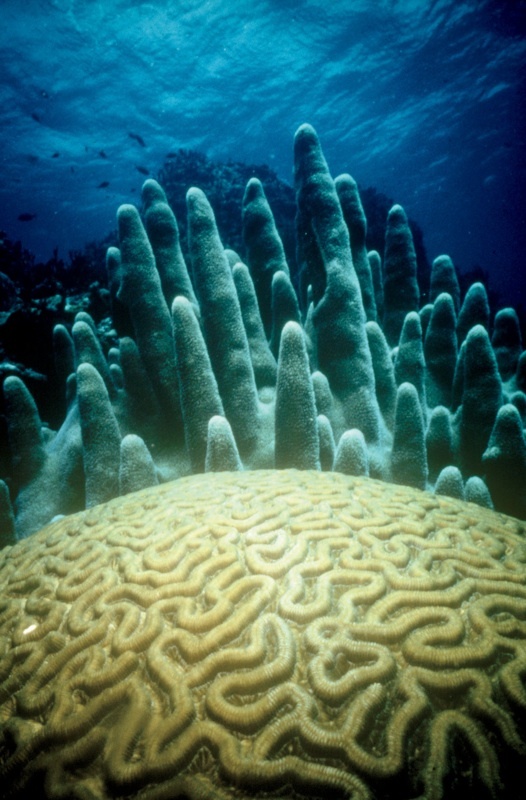 Heat stress also makes coral more vulnerable to bacterial and fungal diseases. Meanwhile, rising levels of atmospheric carbon dioxide, which are making the ocean less alkaline, could hamper many marine organisms—including coral and algae, echinoderms, and molluscs—from forming their normal skeletons, which are made of calcium carbonate, a substance that dissolves as pH drops. Other threats to coral include overgrowth by algae, which thrive in the warm, sun-drenched seas within 20 to 25 degrees of the equator where shallow-water corals grow best. 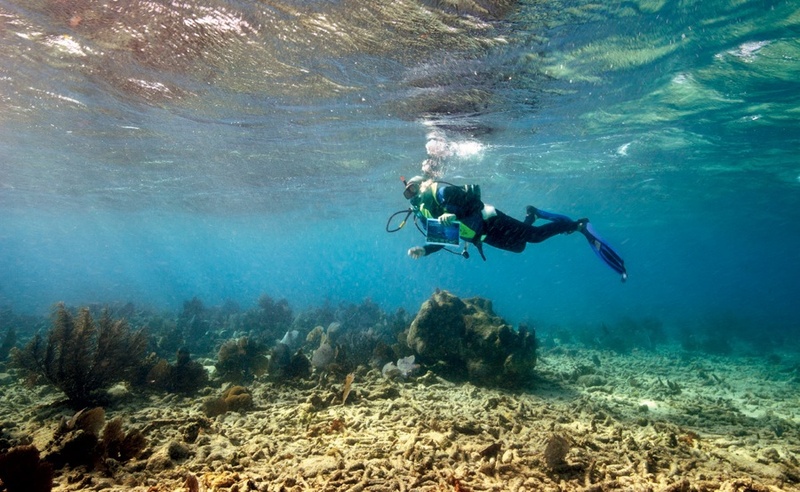 The fact that algae grow faster than coral makes reefs vulnerable to ecosystem disruption. Left unchecked by herbivorous fish or sea urchins, the algae smother entire reefs. As the human population increased in the Caribbean, for example, local fishing depleted the stocks of herbivorous fish to the point that they were “no longer able to do their job in the ecosystem of keeping algae under control,” Woollacott explains. That left only sea urchins to eat the algae. When a massive die-off of sea urchins around Jamaica took place after a 1982 El Niño event (El Niño weather patterns raise regional sea-surface temperatures) the algae, unchecked, overran reefs there. Coastal nutrient runoff, by stimulating algal growth, can have a similar effect. In the Philippines and Indonesia, in particular, dynamite fishing—“The idea is to create a shock wave that will stun fish,” Woollacott explains—threatens the very fabric of reefs by breaking them apart. And in Australia, the Great Barrier Reef is being attacked by crown-of-thorns starfish, which eat coral. (“One of the starfish’s few predators,” says Woollacott, “is a very large gastropod mollusc called Triton’s trumpet, which is valued by people who like to put seashells on their coffee tables.”) At least, he notes, the starfish populations tend to come in bursts, and then crash naturally. 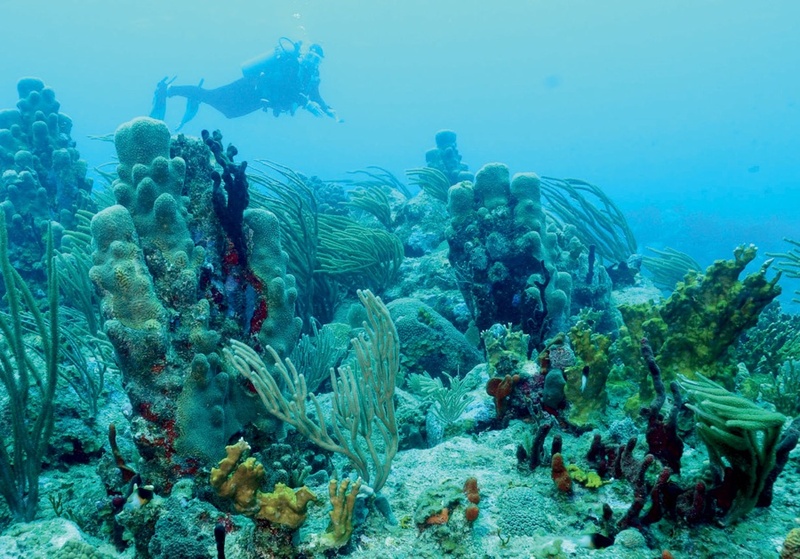 “Without coral,” Woollacott points out, “you don’t a have coral-reef ecosystem,” one of the most “visually spectacular ecosystems in the sea on Earth. You don’t have the beautiful fish, you don’t have the diversity of molluscs. What coral provides is heterogeneity in the environment, both in terms of food sources and with the complexity of the three-dimensional physical habitat in which large numbers of species of different organisms can coexist and interact to form a complex ecosystem.” Coral reefs protect coastlines, generate hundreds of billions of dollars in annual revenue, and, according to the Planetary Coral Reef Foundation, provide the basis for 10 percent of the world’s diet. In Earth’s oceans, they are the charismatic canaries in a coal mine—10 percent have already been lost, and an estimated 60 percent more are at risk. These photographs provide a glimpse of one possible future for these fragile gardens of the sea.